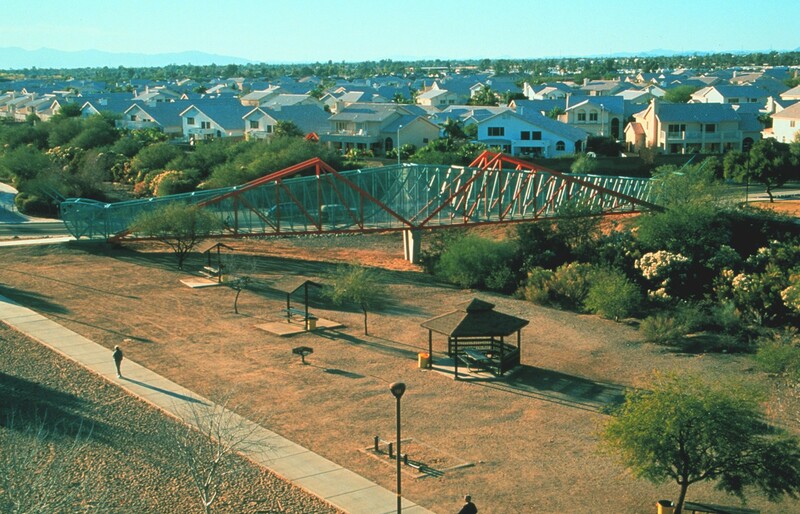 Ed Carpenter worked with staff from the Phoenix Street Transportation Department and the Phoenix Arts Commission, as well as Jerry Cannon of Cannon Associates, a local engineer, to design a 9′ x 210′ crossing which connects two parks. It is used primarily by school children whose passage is occasionally blocked by high water in the wash beneath. 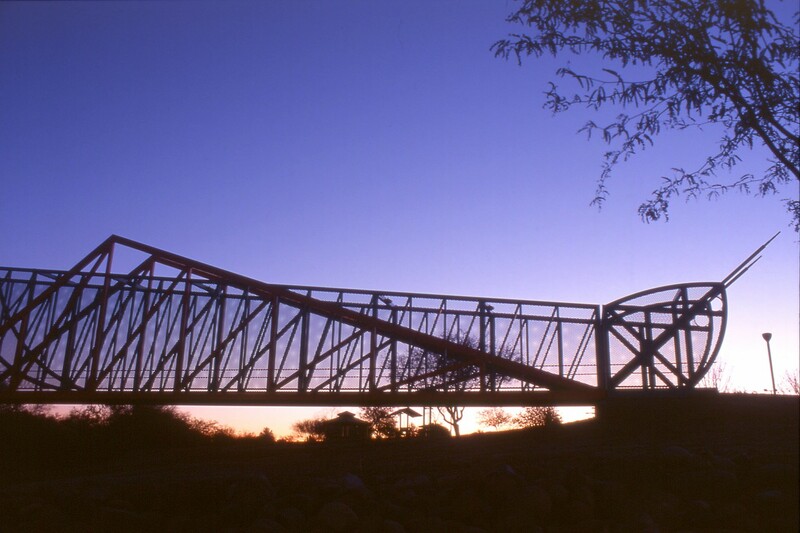 The bridge is highly visible from 7th Avenue, a busy feeder street, which passes immediately to the west. With such a prominent location in the neighborhood, it assumes a more important iconic role than its simple program might suggest. 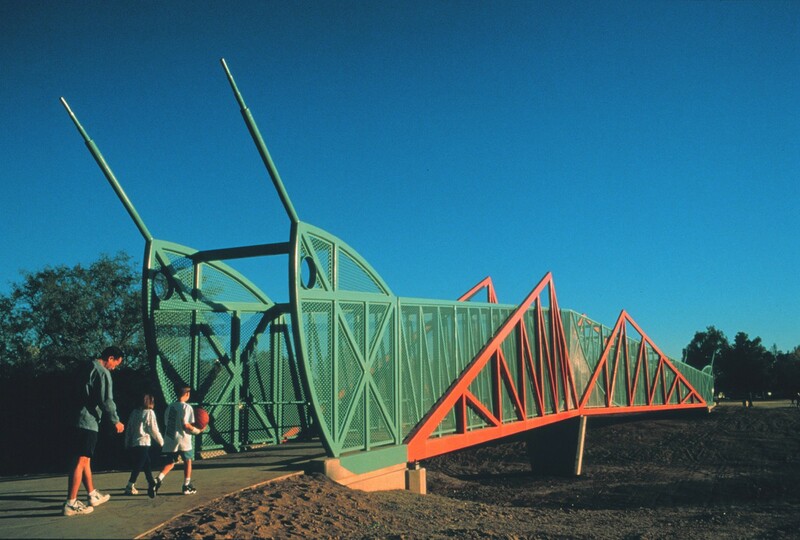 Ed Carpenter’s approach from the start was to seek imagery in designing the structure which captures the imagination of the young users by suggesting a fanciful rendition of two giant grasshoppers. 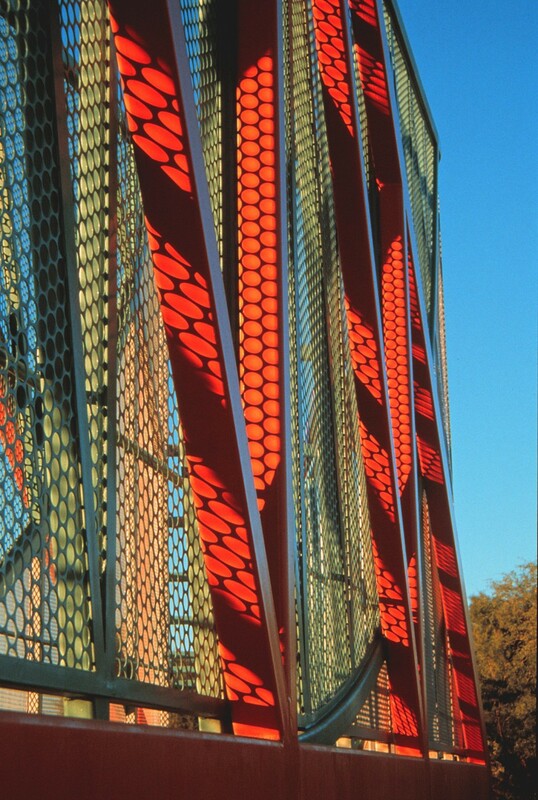 Mindful that the quality of the passage through the bridge is as important as the views of it from the surroundings, Carpenter arrived at solutions which are as exciting in cross section as they are in elevation. Budgetary constraints made this a special challenge. The resulting design looks like something that landed on the site; familiar, but surprising in scale and material. Public involvement has been important throughout the process. 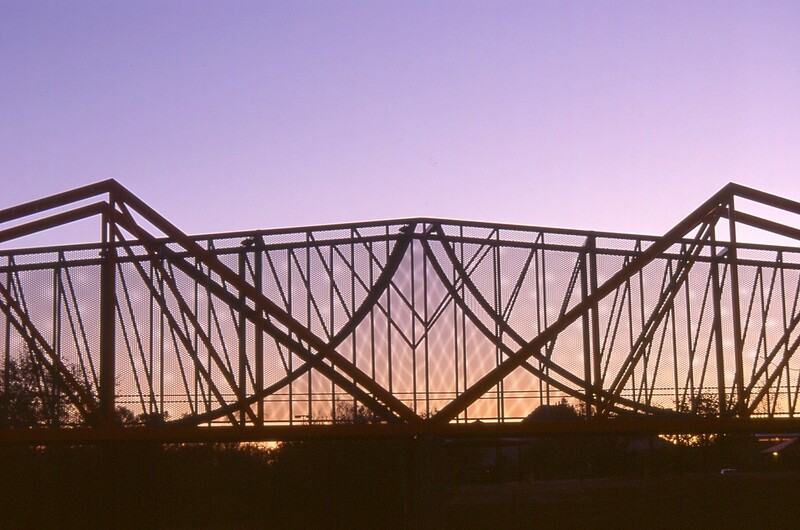 Members of the community not only participated in choosing Carpenter to design the bridge, they also helped select the final scheme. 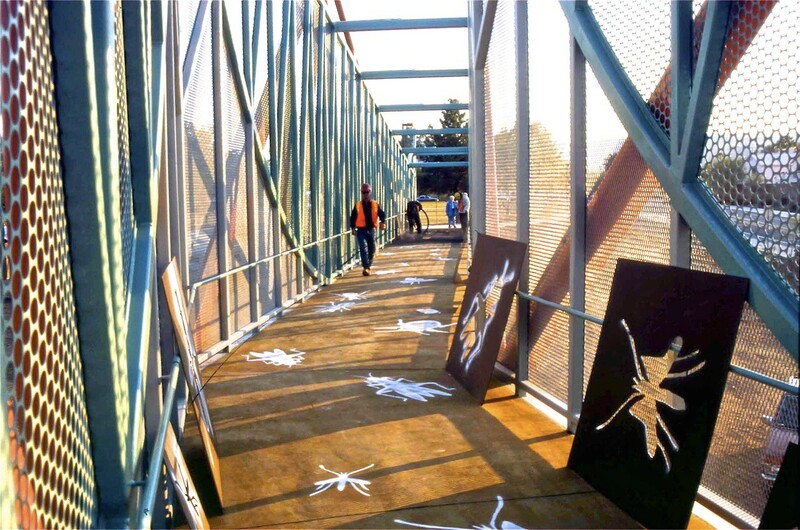 In addition, students from local middle school art classes worked with the artist to design and create related silhouettes which are sandblasted into the concrete bridge approaches. The process was complex and infused with a sense of anticipation and ownership by the local citizens. 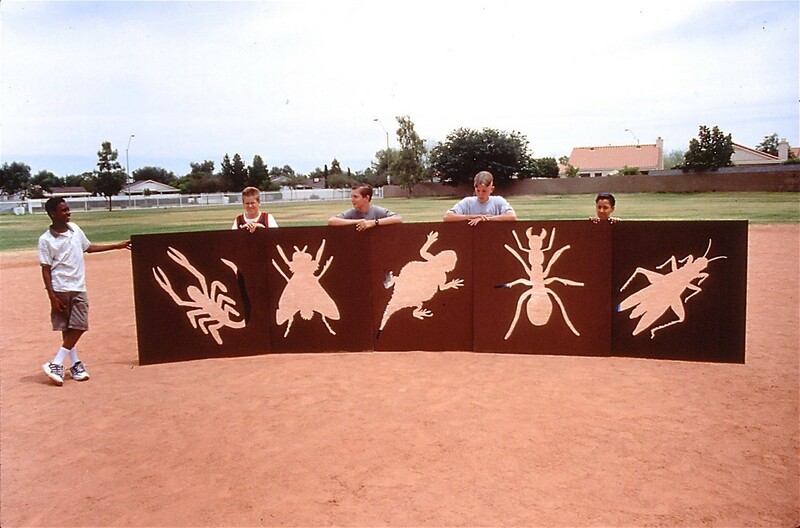 Client: City of Phoenix through the Phoenix Arts Commission Public Art Program.